NYCbound35 169 2.9 Biology Male No NY 2011 Waitlisted Hold, withdrew, received a call for me to reconsider. Very Weird. crossingfingers 165 2.3 Philosophy Male No CA 2012 Accepted Offered 35k/year + 5k binding stipend. Withdrawn. riburn3 161 3.5 3.5 Nursing Male No TX 2009 Applied Health Law and Med School Hospital to work at. genius5432 160 3.4 3.4 Political Science Male No PA 2012 Accepted $15,000/year with 2.33 stip. stilltheoriginal 160 3.2 3.2 History Male No VA 2010 Waitlisted They told me I was given a "top spot" on the waitlist. Not sure what that means. Gavel 158 3.6 3.3 business Male Yes International 2012 Accepted got a prof call after the acceptance. coolkatz321 157 3.8 3.8 Political Science Male No NJ 2008 Rejected Um...really? Spack 157 History Female Yes Domestic 2010 Waitlisted I don't really want to live in Cleveland but Case Western has an amazing health law program. I also happen to know one of the law professors. 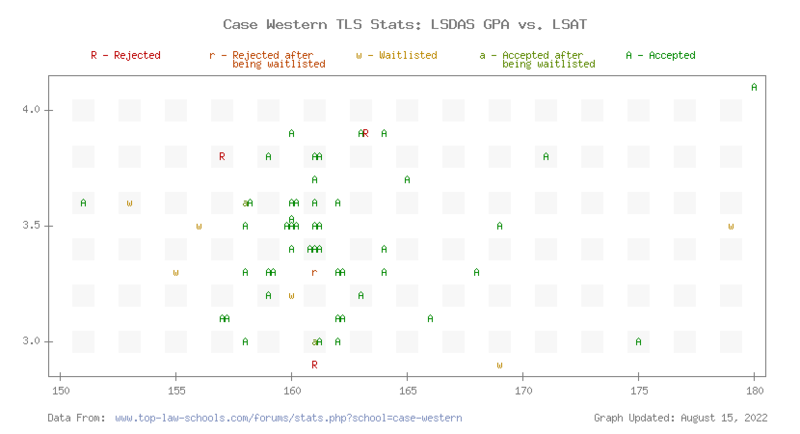 Be sure to check out the TLS Profile on Case Western Law.